The man suspected of carrying out a terrorist attack at a crowded street market in Strasbourg, France, remains at large as of Wednesday morning, French officials warned. 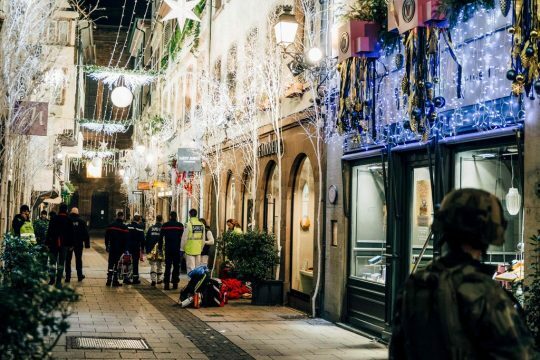 On Tuesday night, a man who police identified as Cherif Chekatt, 29, opened fire on the city's Christmas market. After killing at least two people and wounding 12 others, the gunman escaped with a bullet wound to the arm. Authorities believe he commandeered a taxi to flee the scene. Police had gone to Chekatt's home on Tuesday morning, before the attack, to arrest him on suspicion of a separate murder. He was not home. Chekatt was among the tens of thousands of individuals who French security services flagged as likely radicalized and liable to carry out a terror attack. French prosecutors told reporters that Chekatt had been convicted of 27 prior offenses in France, Germany, and Switzerland. French officials said Wednesday that the shooting was an act of terrorism, the New York Times reported. Rémy Heitz, the Paris prosecutor, who handles terrorism investigations nationwide, said at a news conference in Strasbourg on Wednesday that witnesses had heard the attacker yell "Allahu akbar," or "God is great" in Arabic, and that the targets and the suspect's profile justified the opening of a terrorism investigation. Officials said the man suspected in the shooting had a criminal record and had served time in prison. The Christmas market, at the foot of Strasbourg's iconic cathedral, is a popular seasonal attraction and among the most celebrated in Europe. It draws more than one million visitors each year. Strasbourg, located in eastern France near the German border, is home to the European Parliament. Antonio Tajani, president of the European Parliament, condemned the "criminal attack against peace, against democracy, against our model of life." In 2016, the U.S. State Department warned of attacks on civilian sites in Europe, shortly after France arrested several terrorists close to carrying out attacks. "U.S. citizens should exercise caution at holiday festivals, events, and outdoor markets," the notice said. Several weeks later, a terrorist plowed a truck through Berlin's Christmas market, killing twelve and injuring dozens more. Following Tuesday's attack in Strasbourg, French Interior Minister Christophe Castaner announced that France was on high alert and would be reinforcing its borders to vet those seeking entry. Chekatt is a French citizen. Later Wednesday morning, President Donald Trump tweeted concern about the incident, echoing France's call for border security. Trump had been negotiating the previous day with Democratic leaders about funding for his proposed border wall. France has struggled to eliminate the threat of Islamist terrorism, with Strasbourg emerging as a hub for radicalization. In 2000, security forces foiled an al Qaeda plot to attack Strasbourg's Christmas market and cathedral. In 2015, one of the Bataclan nightclub attackers hailed from Strasbourg. In 2017, police arrested several Strasbourg residents for plotting a major terror attack after they pledged allegiance to the Islamic State. Earlier this year, police in Strasbourg arrested an affiliate of the terrorist who stabbed several people in Paris. Chekatt is a native of Strasbourg. While Chekatt remains at large, police have detained five others in connection with the attack. This entry was posted in National Security and tagged France, ISIS, Terrorism. Bookmark the permalink.